In order to become a great property manager—one that consistently out-performs the local competition—it’s important to become a resource for your property owners. Property owners are looking for a property manager that not only understands the local market trends, policies, and practices but also has a keen ability to showcase the status of their property on a regular basis. Great agents cannot work in a vacuum without any 3rd party support. Too much is expected of them and it isn’t feasible to give the personal care and attention you want to give each property owner once you begin growing your property portfolio. So, how does a smart property manager maintain a personal touch when their business continues to grow and grow, month after month, and year after year? The answer, it turns out, is making smart property management software decisions. And there’s no better place to start than with a digital property inspection tool that showcases just how detailed and involved with a property you and your company are. Property owners love to have detailed reports showcasing every little thing that has changed, evolved, or been damaged at their property. Utilizing a property inspection software tool like Inspect & Cloud can immediately wow your client and make sure that they continue to renew their contract with you, year after year. Property inspection software lets you easily capture a massive amount of detailed information very quickly. 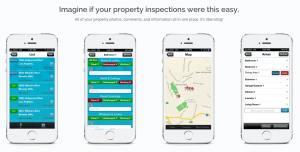 Inspect & Cloud’s mobile app for iPhone, iPad, and Android devices makes it so easy to collect information out in the field that anyone in your office and very quickly perform an incredibly detail property inspection report. To create the report, they simple go through the customizable templates and checklists that you put together when you setup the software. They can add photos, videos, audio clips, or comments to any area or room item in a property. When they are finished, they simple select “Done” and Inspect & Cloud automatically uploads everything to the web (in the cloud) and formats the collected information into a beautiful property inspection report that can be easily emailed to property owners, maintenance teams, or vendors. After working with thousands of property managers around the world, we know that out of all of the property management software solutions available, sending out regular inspection reports to property owners is one of the best retention tools a PM can use. Property owners want documenation that you’re doing what they hired you to do. They want “proof” that the fee they pay you every single month is worth it. Emailing a beautiful property inspection report using the Inspect & Cloud software is an incredibly easy way to make sure that your property portfolio continues to grow and grow. Not only does sending beautiful property inspection reports to your clients help with retention, but you’ll also see increased referrals to your company. Time and time, again, Inspect & Cloud users are able to out-perform their competition in growth simply by putting a sample inspection report in their prospecting folders. Property owners love the ease with which they can see the status of their property and collecting that information and formatting it into a professional report has never been easier. Do a test inspection today and see why thousands of smart property managers are switching to Inspect & Cloud property inspection software.